Just read about a tall grass prairie project at McMaster University. It will be part of the university's research and teaching facility in Hamilton - just five kilometres southwest of the campus. It's a fifty hectare site known as McMaster Forest and the intention is to rehabilitate into a conservation corridor with different ecosystems (meadow, wetland, forest). The tall grass prairie will be 4 hectares and 20 hectares will be a forest set up as a Smithsonian tree plot. The students and teachers were clearing Buckthorn last fall and into the winter and will be removing invasive grasses early spring before planting. 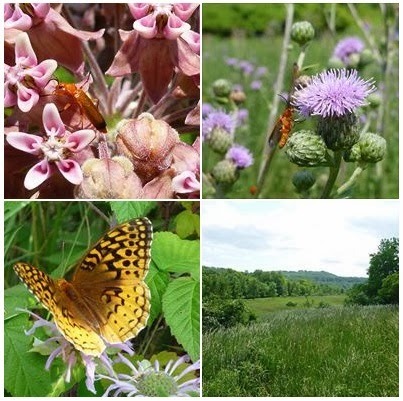 Images are of Common red soldier beetle (Rhagonycha fulva) on Common milkweed (Asclepias syriaca) inflorescence and Canada Thistle (Cirsium arvense), Fritillary butterfly (Boloria sp.) feeding on Wild bergamot (Monarda fistulosa).